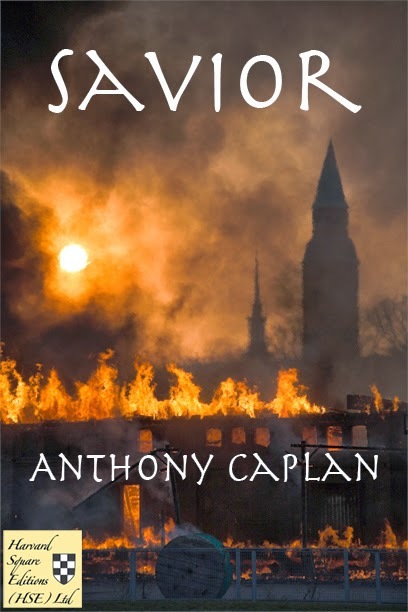 Now on Kindle, SAVIOR . . .
Cambridge, MA (Dec. 12, 2013) -- Savior, the new thriller from Anthony Caplan, marks out new territory for genre fiction, detailing a son's quest to save his father and at the same time exploring a contemporary America overrun by drugs and crime organizations, a country on the brink of destruction from within and without. Al and Ricky, father and son, plan a surfing getaway in Guatemala, the perfect place to bond and reconnect after the death of Mary, the woman who held their lives together. But the Santos Muertos are taking over Guatemala, and when the gang discovers that Ricky has the Chocomal, the Mayan tablet which carries the secret code they need to take over the world with their fearsome Resonator, all hell breaks loose. An unwilling hero, all-American teenager Ricky must find and rescue his father and in the process save us all from utter destruction. Will he learn how to be a real man along the way? Ricky's journey takes him across an America rife with dysfunction and unspoken terrors, evading the US military, methamphetamine dealing motorcycle gangs and marijuana growing hippie communes until he finds the Santos Muertos in their underground compound, where Al has managed to stay alive. The Santos Muertos are not just any old criminal gang, however. Followers of the goddess Santa Muerte, they are modeled on the cult of the same name which exists today in parts of northern Mexico and the southwestern US, and they fully intend to sacrifice father and son in a ritualistic reenactment of ancient Mesoamerican religious practices, before starting the Resonator's cataclysmic horror. Savior marks a turning point for Caplan, the author of three previously self-published works. Harvard Square Editions will publish Savior as an eBook on the Kindle platform on April 18, 2014. It promises to be a page-turning favorite for fans of dystopian, new adult and contemporary literary fiction. A former journalist with the Associated Press and United Press International in Mexico and Central and South America, Caplan currently works as a high school teacher in New Hampshire. The inspiration for Savior came while on a family holiday in Costa Rica. His previous titles include Latitudes - A Story of Coming Home. "Savior sets the tone for life-altering events in the very first paragraph, blending personal with wider world perspectives in a riveting scene that is repeated (in one form or another) throughout the rest of the story, linking a wife's death to a hole in the sky that opens up nearly unnoticed, and another in a heart that can never be repaired. Add an evolving father/son relationship under such conditions and you have a fascinating combination of high adventure and interpersonal relationships that keep Savior an exciting, unpredictable read right up to its emotionally charged (and satisfying) conclusion."